Georgia Sports Blog: So...how exactly is MSU going to stop us? So...how exactly is MSU going to stop us? In all the talk about how the Ringer and the Spartan rushing attack will cause problems for Georgia, I don't see enough discussion of the opposite issue. How is Michigan State going to stop Georgia? Realistically, Ringer will get his touches, and he'll get his yards. However, the Michigan State defense is ranked 71st nationally against the run, 63rd against the pass and 62nd in total defense. By comparison, the Georgia defense is ranked 40th, 33rd and 28th respectively in those categories. In their favor defensively, they allowed 3.7 points per game fewer than the Dawgs. The only offenses that the Spartans have faced remotely comparable to the Bulldog attack were from Cal and Penn State. Two schools that tore into MSU for 38 and 49 points respectively. If we show up ready to play, I'm thinking....44-24 Dawgs win. am I the only one that is starting to think Stafford might stay? with searels back our o-line should protect much better. he could use a senior year to iron out the kinks in this game, which will make his skill set more conducive to a long-term and thus more profitable NFL career. I remember this argument before the Tech game, however, in Tech's (and UGA's) defense, Tech's defense was much better statistically than MSU. "I got 35 million reasons why Stafford goes pro. I love me some me!" Yeah. I was thinking you said the exact same thing about the Tech game. They didn't stop Georgia's offense, but it was in fact the inability to stop Tech that cost them the game. Nice misdirection, though. The one point that should be made is that Michigan State does not run a gimmicky, but effective, offense. They try to do the same things we do: run it, throw in some screens, threaten deep balls, all of that jazz. The only difference is that we have better personell. The point, though, is that MSU isn't throwing the option out at us. I think the style of the offense makes a huge difference. It's not the assignment football we forgot how to play in a quarter against Tech. I, too, think that if we put the 42 up that should have won the Tech game, we'll win this bowl game. 1. Ringer will not get over 100 yards. 2. 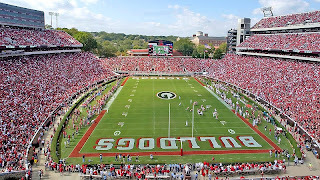 By the time the 1st qrt ends UGA will up by 21 points, offically talking Ringer out of the game. 3. UGA/MSU = Hawaii/UGA part II. Sorry its the truth you negative nancy's. Ringer may get his yards, but they won't come in 50 and 60-yard chunks, ala GTU. Stafford, Knowshon and Momass were superb against Tech, and I expect more of the same on Jan 1. It's only gonna be close if we shoot our own foot clean off on offense. GT put up 350-400 on FSU, UNC and Miami before playing us. Ringer vs. quality opponents. Not so much. Speaking of which. That warrants a post. Im not worried about not scoring against them i am worried about not stopping them from scoring. We made kentucky's offense look good. Stafford projects to be a top 5 pick in the NFL. I hardly see how coming back for a senior year is going to offer much improvement there. What more is he going to learn from the same coaching staff he has now? What more can Richt or Bobo teach him? He might be better off going pro and learning the pro game. He will find out very fast how quick NFL DBs are and that he cannot "Favre" the ball into the same tight slots as he does in college. The issue might be in looking at the top 5 teams and seeing the disarray in playing for Detroit--is there any hope there at all? There are some teams that might be close to turning it around. In the NFL it can happen quickly--see Falcons and Dolphins. If he needs to go pro, he needs to do what Matt Ryan did-sign and get into camp ASAP. Do not follow the leads of Brady Quinn or Jamarcus Russell. Does anyone know of a great NFL QB who held out for a long period of time? However, I would not be surprised if he stayed. He has been talking to the Manning clan and their take seems to be to stay. I think having 2 guys who won Super Bowls telling you to stay would mean a lot. Also, if he has a bad senior season, he drops to a better team. Worked out okay for Dan Marino! (Okay, no Super Bowl wins, but a great career). I think looking at who stayed and how their transitions were (Ryan, the Mannings), and given who he'd be going to if he came out, Stafford might just stay. As far as how he could benefit, it's not like he blew away the competition this year. He was very, very good, but it's apparent that he could still learn some things from playing the college game. It wouldn't surprise me at all if Stafford stayed. His parents have talked about how they want him to get his degree and I think he really could benefit from another year. His mechanics are fine but his decision-making could be improved. I think he knows that. I also think the possibility of going to the Lions is a huge factor for him even though he denies it. I also think that UGA will probably destroy MSU. You can't win with one guy and that's all I really see them having. With the news on the salary cap tonight, I think Stafford stays. The Mannings have advised him to do so and I have heard that Matt Ryan also talked to him. Goodell announced tonight that there will be no rookie cap for at least a couple of years. You made the same argument before the Tech game. That didn't work out so well then either.